I was at the Avenues heading towards my favorite clothing store Express but couldn’t find it in its usual spot. I figured they might have moved it to somewhere else, just like they did with the clothing store New Look (I believe New Look used to be where Forever 21 is now… or was it Next?) ages ago. I searched high and low for it before I realized that Express was gone for good. Obviously, I was devastated because I had truly, truly loved Express. With that being said, during my search for Express, I stumbled upon the newer location of New Look (top floor)… again. I’ve been to the newer location of New Look before (I wanna’ say two years ago) but somehow keep forgetting its exact location. Now I’ll remember for sure because I noted that New Look was facing VaVaVoom (second floor), wedged between Accessorize on one side and Mammas & Papas on the other. In any case, this was back in November when New Look were having a Buy Two Get One Free deal going on so obviously I decided to take advantage of that deal. As soon as I laid eyes on this Military Coat I was instantly reminded of the zombies on the Origins map in Black Ops 2 (Xbox 360). I knew then and there that I just had to have it. I mean just look at it. It looks so freakin’ cool! 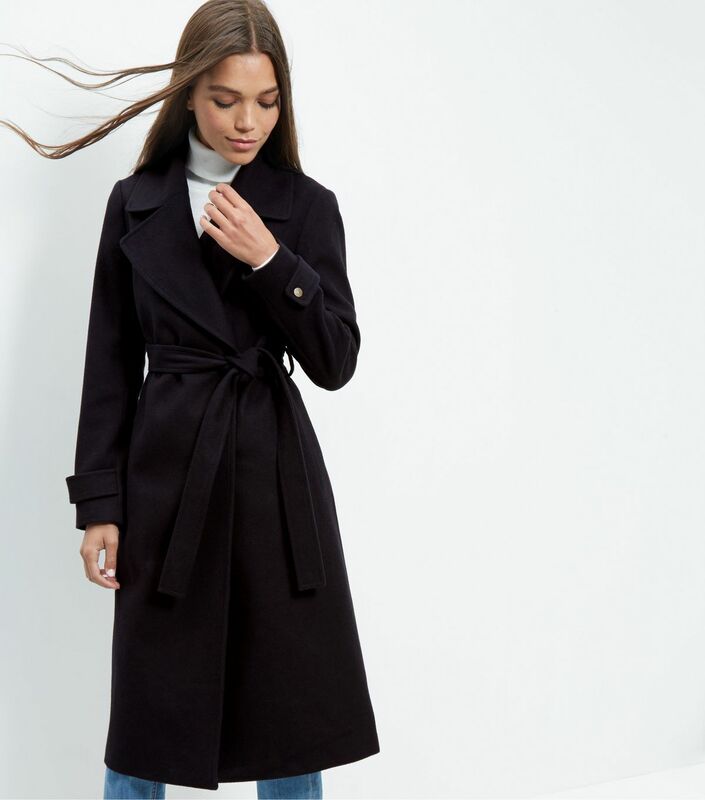 There’s nothing girly or frou-frou about this Military Maxi Coat. It’s not cinched in at the waist. It doesn’t have any ruffles. It’s completely straight with a casual fit and simple design, which makes it even cooler! I love that it’s a maxi too! The extra length will keep me even warmer in places where the weather is something crazy like -15 or something. I highly doubt I’m going to Russia anytime soon but I’m sure this Military Coat would come in pretty handy in places like New York, Germany, Japan…. or more likely the United Kingdom. 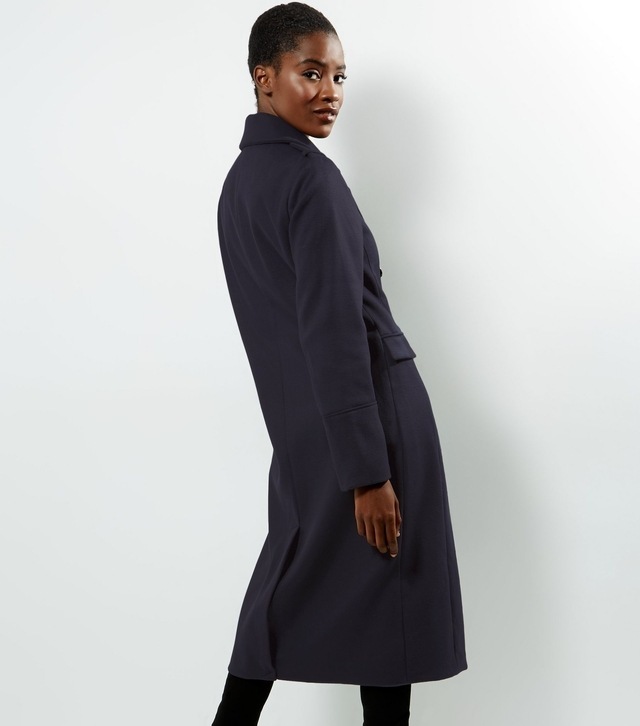 With that being said, the coat hits the 5’8 model below the knee, so you can imagine how much of a maxi this actually is on my 5’1 frame. I believe the fact that it’s quite long makes it look even more authentic as a Military Coat! I can always pair it with heels (boots that have a high heel rather) to add a little height… if I ever felt so inclined. Honestly though, the whole reason I fell in love with this coat was because of the whole masculine vibe thing its got going on and sexing it up with heels might possibly ruin that effect. Best of all, the fifty buttons (okay fine, just six) aren’t a tacky yellow-gold! They’re more of a subdued pewter and get this… they’ve all got a matching coat of arms (like something out of Game of Thrones!!!!) on all of them! That said, only two of those six buttons can actually be fastened. The rest are just for show, as are the pockets. That’s my only complaint about this thing; I wish the pockets were real. It came in several colors including black, khaki, and navy. I felt like the black would seem a bit too dramatic and might overpower the overall design of the coat (all the little details like the shoulder boards, and the front pockets wouldn’t show). Personally, I’ve always loved green (be it in makeup or clothing or even accessories) because I believe wearing green consequentially makes my brown eyes look kinda’ green-y too, but I felt the khaki was a bit too on-the-nose (Russian Military and all) in this case, which is why I opted for the navy (shown above). 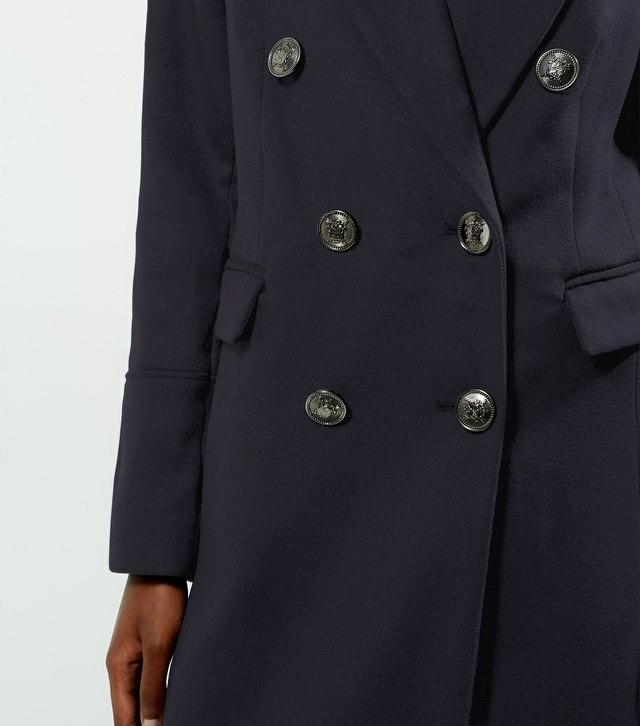 I also chose the navy because I can imagine Czar Nicholas II’s daughter wearing something similar way back when. 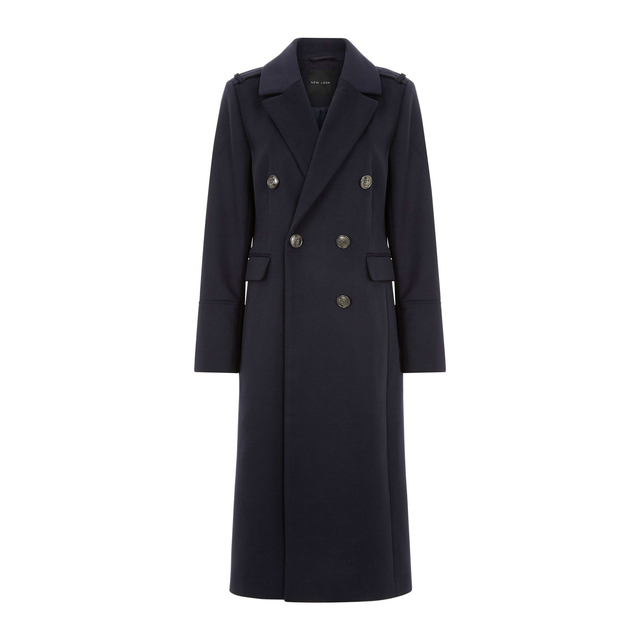 Navy Military Maxi Coat was purchased for KD32/000. I didn’t really set out to buy coats. It’s just that I had instantly fallen in love with Navy Military Maxi Coat and since it was priced at KD32/000 I asked to see anything else that was priced in that range (because of the Buy Two Get One Free deal, I didn’t wanna purchase something for KD30+ and get the other two at KD5, ya’ feel? Yeah, you do.) which turned out to be coats. 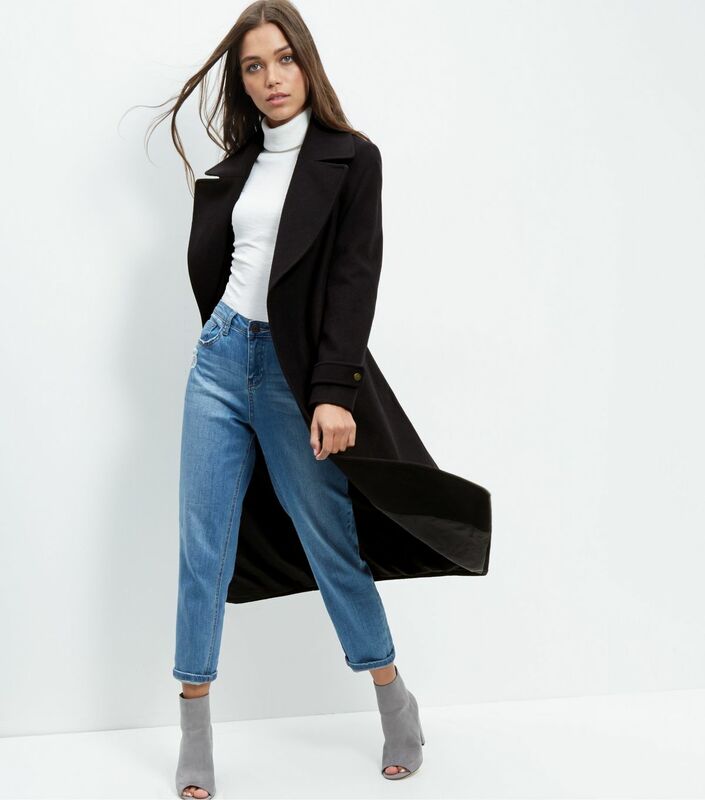 I’d already been eyeing up the Faux Fur Collar Belted Longline Coat so I was delighted that it was one of the higher-priced items (as opposed to the rest of New Look‘s ridiculously inexpensive items). Let me preface this by saying I’m not big on fur, or even faux fur. Fur, faux or otherwise, can easily come across as hella’ tacky and cheap. I know Arabs are quite fond of their fur coats especially for fancy-schmancy events but the thought of parading around with a dead animal hanging off my shoulders creeps me out. I’m not gonna’ sit here and pretend that I’m some animal rights activist or whatever. I just think authentic fur is gross, is all. As for faux fur, sometimes it can actually look pretty at first (especially if it comes in unconventional colors), but it gets hella’ dirty hella’ fast. Speaking from personal experience (Ikea Faux Fur Rug) faux fur just ‘aint worth the upkeep. As such, although I’d been eyeing up this coat, I was still iffy about purchasing it because of the whole upkeep thing. It came in several colors including tan coat with a brown faux-fur collar, a speckled black and white coat with a black faux fur collar, and a black coat with a white faux-fur collar. 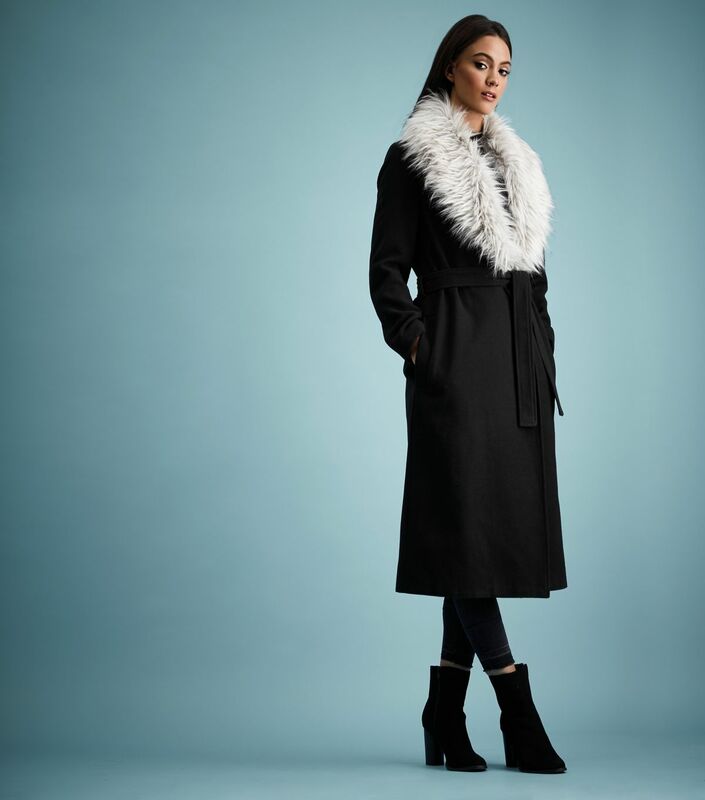 Initially, the black faux-fur collar appealed to me the most but the speckled black and white coat it was attached to, turned me off the whole thing. The tan coat seemed too trendy for my taste. I feel like I’ve been seeing that shade in every article of clothing or accessory imaginable, for awhile now. Don’t get me wrong, I’ve got a handful of tan stuff in my wardrobe but a tan coat seems too limiting, especially since Winters in Kuwait are the blink-and-you-miss-them kind. As such, I chose to go with a practical black for this impractical coat. Black is always flattering and also pairs well with almost everything else in my wardrobe. I figure since this coat is so extra (at least for me), I could tone it down with some blue jeans and wedge sneakers. For reference, the model in the photo is 5’8 whereas I am 5’1. As you can see, it’s another one of those longer coats, which I adore! Between Anime, where the main character’s trench coat is always flapping dramatically behind them and The Matrix, where Keanu sported that ridiculously cool duster, I’ve always thought longer coats were aesthetically appealing. Whether I can actually pull them off is a completely different matter. The selling point for me was the faux-fur white collar though. 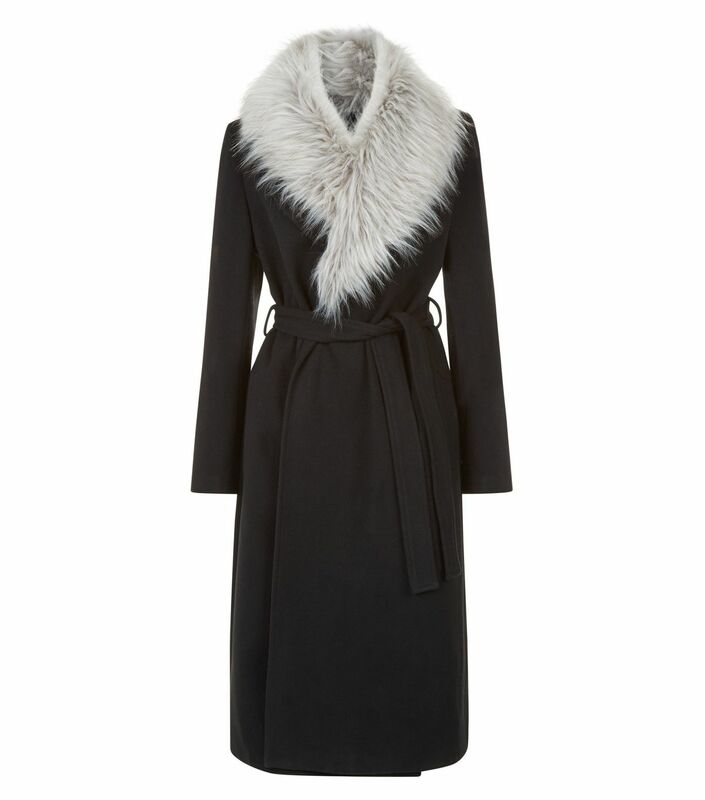 I love the contrast between the white faux-fur collar and the black coat! It just look so striking! The coat itself isn’t all that special. To me, the fact that it’s belted makes it veer way too close to bathrobe territory. Thankfully, it also has pockets, unlike the previous coat. 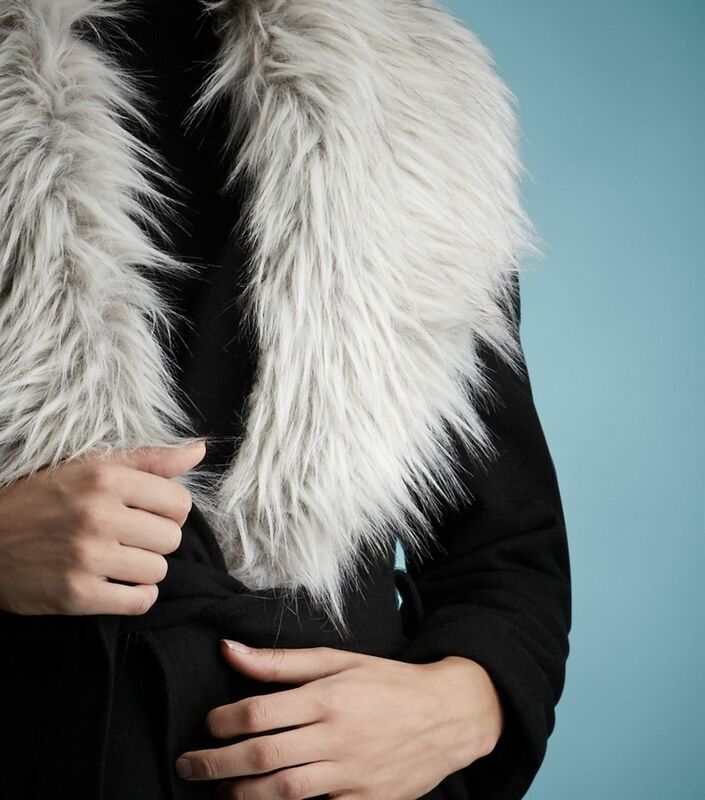 With that being said, the white faux-fur collar also happens to be detachable. The whole reason I got this thing was for the collar but it’s nice to know I’ve got options. The fact that it’s detachable also helps with the upkeep. Even when I tried this on in-store, it pretty much started shedding all over me. I don’t mind though… it’s kinda’ like having a cat but not really. I’m not sure why but I feel like this is something a British Rock Star would’ve worn back in the day. I feel like I could pair this coat with wet-look leggings, a slinky top, and possibly some icy blue colored contacts to emulate that gorgeous androgynous look that Emma (Big Brother/Celebrity Big Brother Host) pulls off so effortlessly. 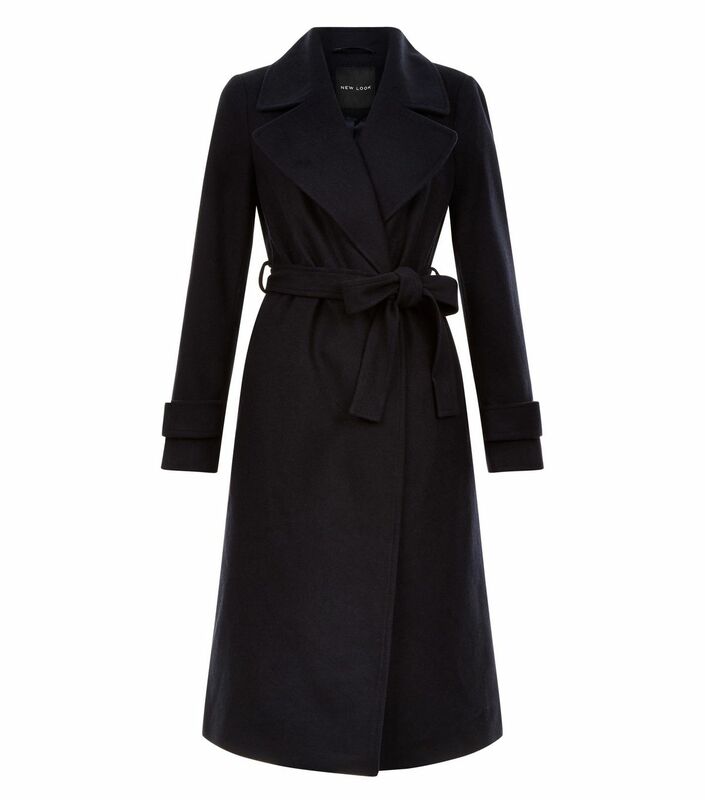 This Black Faux-Fur Collar Black Belted Longline Coat was purchased from New Look for KD34/500. 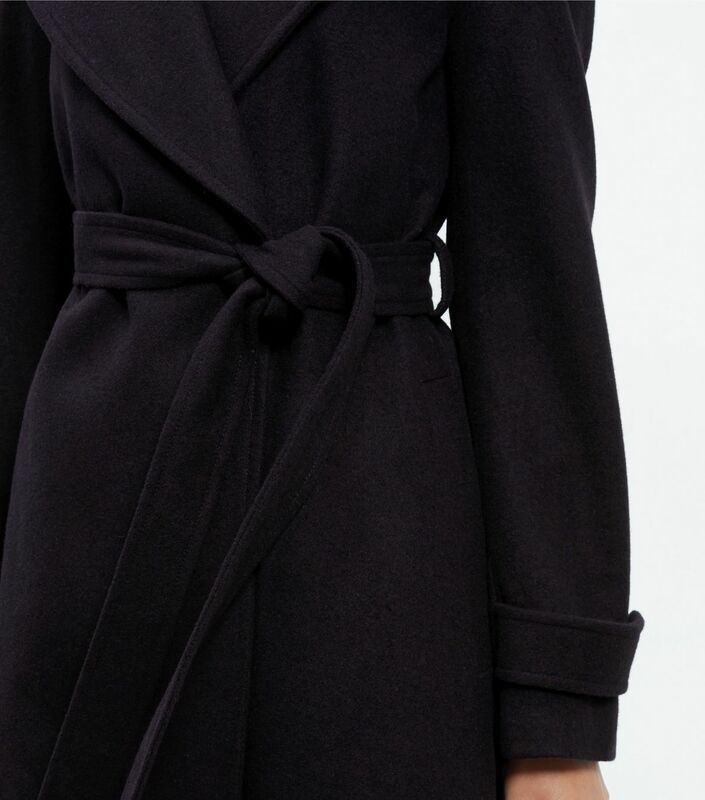 Lastly, I picked up this Wide Collar Wrap Front Longline Coat. There weren’t many options for me as everything else cost significantly less than the KD30. It was either this or a Sleeveless Coat (which I was told was a best-seller) or a faux-fur-lined Parka or a tacky Animal Print Coat. I went with the coat that was similar to the other two coats (If I like something, I stick with it). It came in several colors but I went with the navy (even though it kinda’ looks black) because I feel like it’s something Jackie O might’ve worn. It’s simple yet feminine and elegant! It’s also on the longer side (as shown on the 5’8 model) and it’s got pockets which I appreciate. I don’t usually carry anything around in my pockets (unless it’s a tiny USB) because it creates bumps and lumps ruining the overall silhouette of whatever I’m wearing. However, I do so love sticking my hands in my pockets when I strut (less awkward then having them sway all over the place). Plus, it makes me feel like I’ve got a little swag going on (probably only in my head). I don’t know why they’ve paired it with cuffed boyfriends jeans because I would totally take advantage of the feminine (almost A-line) silhouette and pair this with pretty dresses and heels but that’s just me. I feel like there was a conspiracy to try to make this coat look bad, and everyone from the stylist and the photographer were in on it. It really is a lovely coat in real life! At least from this angle you can appreciate the sleeve straps. Don’t they look so cool? Also that wide collar is ridiculously flattering, even from the back, and apparently looks great with a turtleneck. This whole wrap front closure business still looks too similar to a bathrobe but that’s okay because I can just do what all the cool girls are doing and get rid of the tie strap, thrown on a huge Obi belt over-top and leave it open… or more likely, just tie into a cute bow! Out of all the coats I got, this one is the prettiest and most wearable and most versatile! I could just throw this on over any dress and it would look great! I could throw this on over some dark blue jeans and a dark blue top and pair them with Converse High Tops for that monochromatic look. Full disclosure, I’m just saying I imagine it might look nice paired with it but I’ve never actually owned anything from Converse. Even though it’s the least expensive out of all the coats I got at New Look that day, this one really is the prettiest! I feel like this is something a pretty french girl would wear over a dress paired with sky-high heels while having coffee at a darling cafe somewhere in Paris. 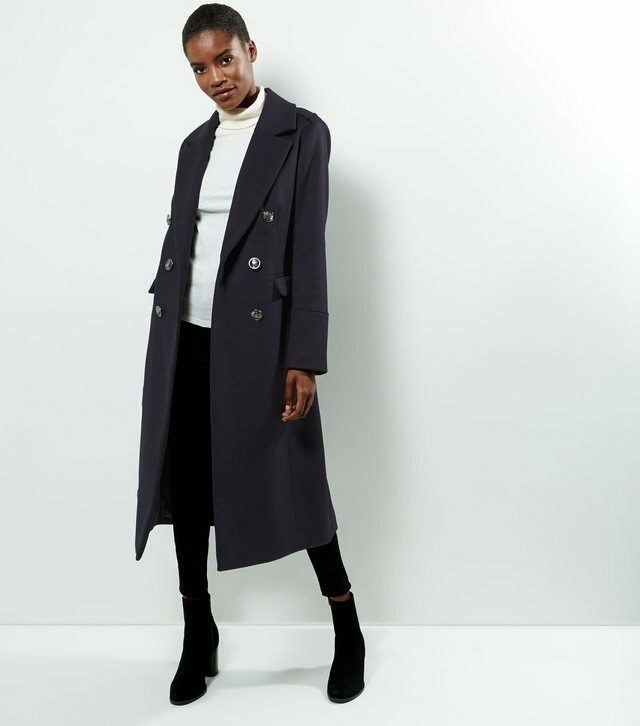 This Navy Wide Collar Wrap Front Longline Coat retails for KD29. I’ve got a masculine coat that’s ridiculously cool (which my mind associates with Russia and Germany and any other place with ridiculously cold weather… and also Black Ops 2 Zombies and Czar Nicholas II’s family…), a crazy coat that’s a bit “extra” and makes me think of beautiful androgynous British Rock Stars (namely the late David Bowie back in the 80’s) and lastly a feminine and elegant (almost regal!) coat (which makes me think of Paris and Jackie O) so I’m pretty pleased with the haulage! With that being said, Winter has come… and gone, but I’ve yet to wear any of these coats. There was talk of going to London for the weekend, back in January, but that plan went bust. I’m not too bothered by it because I can always wear these coats during the next Winter… and the Winter after that… and so on. Hope you enjoyed this haul (I know it’s a little different from my usual content)! Did you have a favorite? Did you hate any of them? Would you alter any of them in any way? What would you pair with each of them? Feel free to share your thoughts!